The study is the largest drill program in company history and is focused on optimizing mine development. 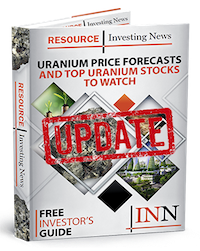 Uranium explorer NexGen Energy (TSX:NXE,NYSEAMERICAN:NXE) has announced the commencement of a feasibility and technical study at its Rook I property located in Saskatchewan. The drill program results will be incorporated into a NI43-101 bankable feasibility study, building on the successful outcomes highlighted in the company’s pre-feasibility study which demonstrated the Arrow project to be an exceptional development opportunity for NexGen, Saskatchewan and Canada. Convert high grade indicated mineral resources to measured mineral resources: approximately 71,000 m will be drilled at a spacing sufficient to support the conversion of the currently defined high-grade indicated resource (currently 256.6 M lbs of U3O8 contained in 2.89 M tonnes grading 4.03 percent U3O8) to measured resource. Measured mineral resources represent the highest level of mineral resource estimate, providing a significant amount of technical detail on the FS mine plan, design and economics. Covert inferred mineral resources to indicated mineral resources: Approximately 54,000 m will be drilled to support the conversion of part of the currently defined inferred resource (currently 91.7 M lbs of U3O8 contained in 4.84 M tonnes grading 0.86 percent U3O8) to an indicated resource. Further conversion of inferred to indicated mineral resources will optimize the usable mineral inventory for the FS mine plan which can only incorporate Indicated or higher classification resources in compliance with the NI 43-101 guidelines. Given the strong continuity of mineralization seen at Arrow, the conversion of Inferred to Indicated resources since delineation drilling commenced has been very efficient and predictable. Geotechnical and hydrogeological characterization: Approximately 12,500 m of the 125,000 m will also incorporate the geotechnical and hydrogeological characterization of the rock mass in the areas of potential mine development and Underground Tailings Management Facility (“UGTMF”). This additional analysis will build upon the significant geotechnical, hydrogeological and metallurgical testing that has been incorporated into the PFS.